With the availability of easy information, and the access to so many ideas via the Internet, the awareness of copyright has never been more important. This past week, two events highlighted this: World Book and Copyright Day on April 23 and World Intellectual Property Day on April 26. Activities on both days highlight inventors, designers, and authors whose works have improved our cultural heritage. In light of these events, today’s blog provides a way for us to encourage the promotion and protection of innovation. Whether you’re a producer or a consumer, knowing the basics will help you navigate the rapids of information. In February, Canada gets a new flag (the one with the maple leaf). My Fair Lady wins the Best Picture Oscar in April. In August, LBJ signs into law the Voting Rights Act. Need more? Check out one of the titles below, all of which were on the New York Times Best Seller List for the week of March 21, 1965. This spring we’ve been looking at the idea of “work”. We’ve teamed with the Magic Valley Arts Council to help highlight their traveling Smithsonian exhibit The Way We Worked by presenting the Let’s Talk About It series on “Working Making a Living, Making a Life.” And we’re also showcasing some of our historical photographs in a mini-gallery featuring what working was like when the Magic Valley was young. With that in mind, here’s a list of nonfiction books about people and their work. Whether they tried out something new, or are writing about the behind-the-scenes of their current career path, the people in these jobs offer us a different glimpse of the daily grind. 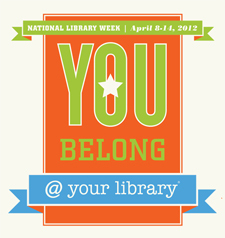 Next week is National Library Week, so take advantage of the most valuable card in your wallet! Stop by to check out our awesome materials or our even awesomer events; even some of our normal programming has been “revved” up! On Tuesday (10), join us for a special Book Club, honoring National Poetry Month. We will meet at 5:30 PM and will discuss Poetry 180, a great anthology of contemporary poetry edited by former U.S. Poet Laureate, Billy Collins. The first 10 participants will also get a free copy of this month’s issue of Poetry magazine, which is celebrating 100 years of publication! On Wednesday (11), our resident local historian, librarian Mareda Wright, will be presenting “Life and Art Are One: Jessie Bisbee, Her Husband Clarence, and the Historical Photography of the Magic Valley” at 7:00 PM. She’ll talk about her research into the woman behind the man behind some of the area’s most iconic images. Check out the Times-News article, too. Also, we’re ready to reveal our newspaper digitization project! Thanks to a stimulus grant, our local Twin Falls newspapers, dating from 1904 through 2008, have been digitally transferred and are now searchable. Of course, the process isn’t always perfect, but we think it’s a great thing – much better than going through every page! Have fun researching. Finally, as part of National Library Week, we’re conducting a survey to find out what our community thinks. Help us out by letting us know what you like, what you don’t, and what you’d like to see us do in the next five years. Click here for the survey!